Posted on October 17, 2015 by MT	in African American Parenting, Black Parenting, Parenting, Parenting African American Males, Parenting African American Youth, Parenting Black Boys, Raising African American Men and tagged 150 ways to show kids you care, African American parenting, African American Student Success, African American students., America's Promise, black males and sports, black parenting, blacks in suburban schools, coparenting, parenting african american males, parenting black boys, parenting males, raising african american males, save black boys, single parenting, teenage sports, teenagers and communication, youth football. One of the best tools that I took away from my training as a Parenting Partners Workshop Facilitator was the pamphlet “150 Ways To Show Kids You Care” (c) distributed by The Search Institute. The brochure lists 150 ways to interact with your children or other children in the community that would cause them to believe that you genuinely care about their well-being. I have it posted right next to my door as a reminder for me, amidst the daily rush in and out of the house, to make a conscious effort to connect with my kids. Again this list also applies to family members, your children’s friends, mentees or other children you nurture or spend time with. Sometimes I ask my children to pick one, sometimes I ask them to choose a number in between one and one hundred fifty and sometimes I close my eyes and choose whatever number my finger lands on. I will try each day to post the item that was chosen and write a little about how I applied it. Today it landed on #62 “Encourage Win-Win Situations“. Sometimes I’m not sure about how I will apply the item of the day but by the end of the day, the opportunity presents itself (or I get creative 🙂 . My thirteen year old son loves football. If he’s not playing himself, he’s playing it on Madden, watching College Football on television or videos about the science of football on You Tube. I’m not saying he’s the next Heisman Trophy winner but he is aggressive on defense, easily teachable and the coaches love him. I say all that not to brag but it helps you to understand the dilemma. His Quaker high school does not have a football team so I registered him with the local area football league. Several weeks into practice his coach reveals to me that the league was unable to recruit enough kids for the Senior 130 pound varsity team. This meant there was a strong possibility that my would not be able to play on the 120 varsity team at his current age and weight combination but he assured me the coaches were working on “trying to get him in”. I wasn’t quite sure what that meant but he somehow made weight for the first three home games and I didn’t think more about it. Last week was an away game and he didn’t make weight. The officials said he was 13 pounds over and would have to lose at least 6 or 7 to continue playing. I looked at my slim, still growing thirteen year old son (he’s about 5’3, 120 pounds) and knew that he did not have six pounds to lose! I knew he would be heartbroken, so I thought about item #62 and tried to figure out how to break it to him that may have to give up playing football with it being too late in the season to join another league. How could this situation end up as a win-win? I talked to my brothers, his father and a college friend who trains college athletes and they all concurred that he should be gaining weight, specifically via muscle rather than losing. 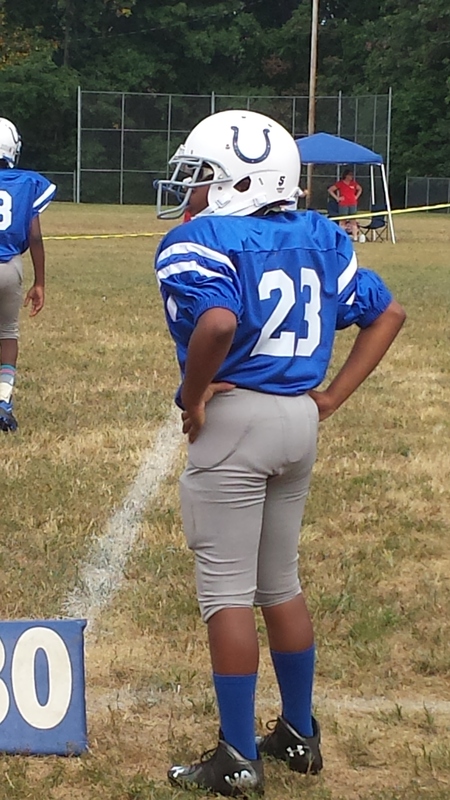 I realized that his coaches didn’t have my son’s best interest in mind and were more concerned about winning games. It was slightly flattering, but I knew that I needed to talk to him and support him in making the right choice for him. I decided to approach him at his favorite place, on the trampoline in our yard, and we had the conversation. We talked first about his feelings on the matter and I shared mine. Though he would rather play, he understood the importance of gaining muscle especially in such an intense sport and agreed that if he was unable to play out the rest of the season he was okay with taking a weight training class at the local YMCA. He also knows that his parents have is best interest in mind and care about his happiness. I gave him choices and feedback and he learned how to look at his options and make the best choice for him. He’s content and I’m a happy parent. Win. Win. Please feel free to share how you’ve applied this successfully. Thank you for reading and keep coming back!